These aren’t perfumes, mind you; they’re creams (and no, they’re not edible–although they are full of several excellent ingredients). 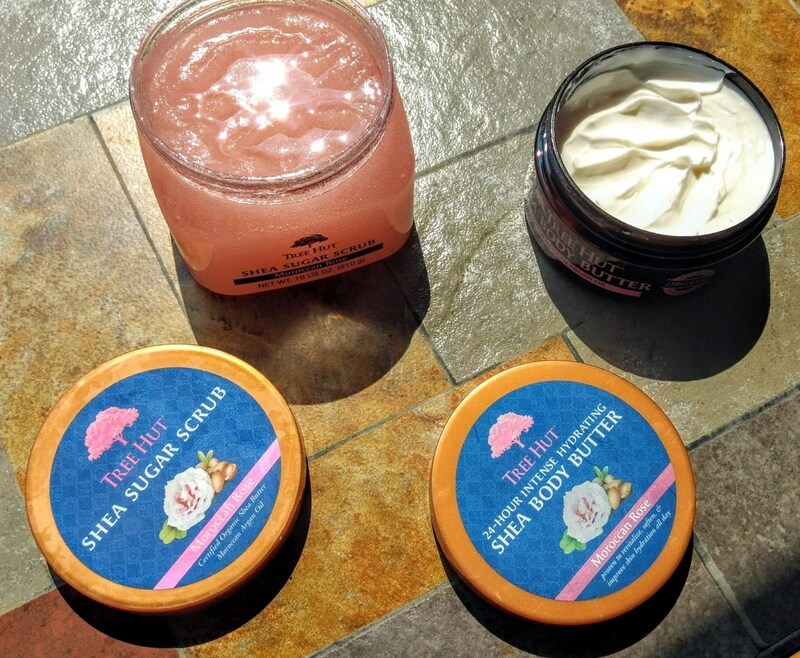 More specifically, Tree Hut’s 24-Hour Intense Hydration Shea Body Butter, Tree Hut’s Polishing Facial Scrub in Refining Rose, and Tree Hut’s Shea Sugar Scrub. The body butter really goes on just like its name would suggest, and DOES make your skin feel buttery soft. It’s white, thick, and packaged in a beautiful container that definitely deserves a place on my nightstand. And that smell? I still can’t figure out what it is that the smell reminds me of, but it’s something distantly akin to a cupcake. A Moroccan, rosy cupcake. And that’s coming from someone who hardly ever likes to smell perfumes, candles, or creams! I also got a body exfoliator for the shower. It’s name? The Tree Hut Shea Sugar Scrub. This scrub is also in a good-sized, beautiful container (I can’t say enough about this collection’s wonderful packaging and smell!) like the Body Butter; it’s thick, pink (more so than in the photograph), and squishy. The little pink sugar granules rub delightfully all over your body, just as the exfoliating cream did with your face–but in the shower, with pink sugar being used instead of cream, you’ll come out supremely sweet and soft! Speaking of scrubs, I also got an exfoliating scrub for my face! Tree Hut’s exfoliating scrub comes in a large container, which is exciting, and it, too, is a white cream. You may not need to exfoliate every night, but this soft and creamy scrub will certainly do the trick if you’re doing it every few days! Cleanse your skin with something soft like Cetaphil, then exfoliate with this scrub and finish with a soft moisturizer (such as BOOM! Cotton). 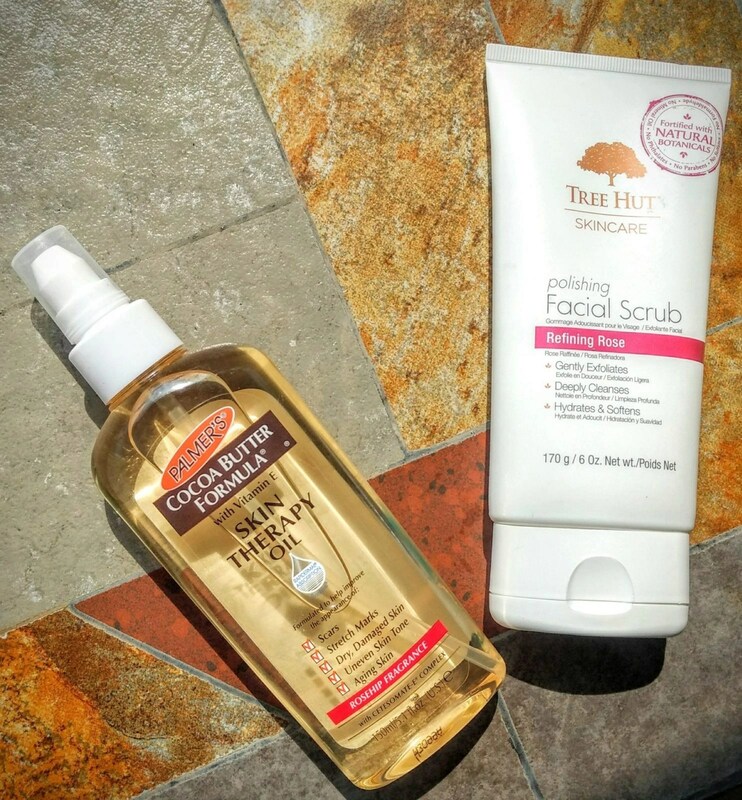 Tree Hut’s scrub is a delightful way to slough off dead skin cells and refresh yourself! The next product was Vitamin E oil, with rose-hip fragrance, from Palmer’s. Vitamin E is known for being a wonderful ingredient, particularly against free radicals, and rose-hip is known for helping with scars. I’ve begun using it on scars and on my arms, and am seeing excellent improvement little by little! The oil has a subdued scent, goes on smooth, and is a nice, clear color–meaning it hasn’t stained any of my clothes, either. 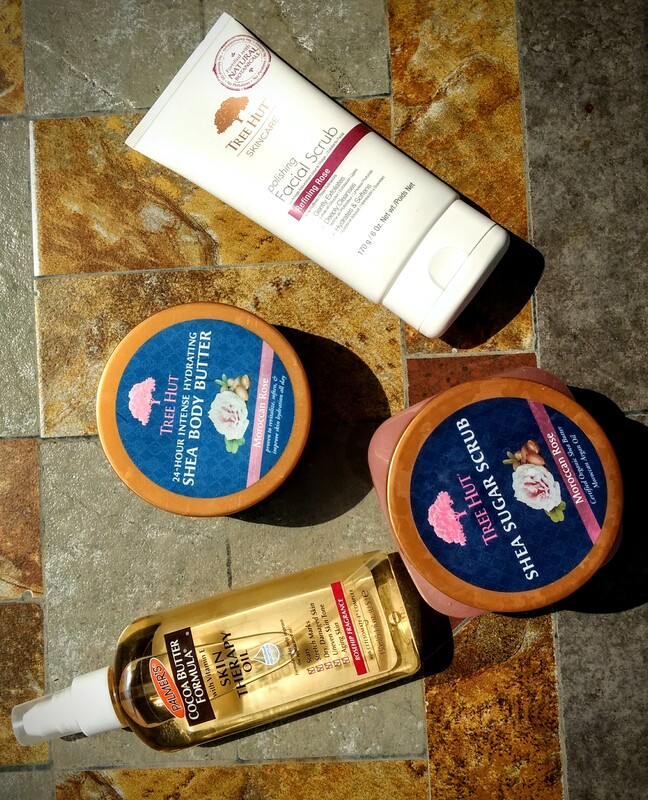 With this oil and Tree Hut’s Moroccan Rose products, you’ll be ready for a lifetime of sweet-smelling, healthy skin! Interested in these products? Find Tree Hut’s products on their website, and check out Palmer’s website–and be sure to follow both companies on their social media, linked below!